A contemporary washroom is just what you need for your commercial building. Image can be just as important as the functionality of your washroom, and it should reflect your brand and the rest of your building. If attention has been given to the rest of your building, but your washrooms have been neglected and are in need of updating, new washroom hand dryers are a simple way of sprucing them up. Your clients and customers deserve to have a clean, hygienic space to use the toilet and washing facilities. This may be the last place they visit in your building and if it’s not up to standard can leave a negative lasting impression of you and your business. So, ensure that every part of your commercial building is of a high quality including your washroom by installing the latest hand drying technology supplied by Blow Motion. Here are some of the qualities of our commercial washroom hand dryers and how they can update your washroom. As mentioned earlier, the look of your washroom can really determine whether the people occupying your building have a comfortable and positive experience in your washroom. The washroom is the perfect place to be creative with design and reflect your brand’s image. If your brand is all about being contemporary and modern, then you need washing facilities that reflect this. Most of our hand dryers have a sleek and modern design and are available in a range of colours including black, white, and silver so that they can fit seamlessly into modern decor. Advertising your brand any way you can will be beneficial to your business, so take advantage of our customisable hand dryer service. You could personalise your washroom and have your brand logo printed onto your hand dryers. This is the perfect place to advertise as for at least 10 seconds the user will be focused on the hand dryer whilst drying hands and therefore on your brand logo! Contemporary, customisable, hand dryers are the perfect way to update your washroom. Your customers and clients deserve the very best quality and convenience so when it comes to choosing commercial washroom hand dryers choose high speed jet blade hand dryers. 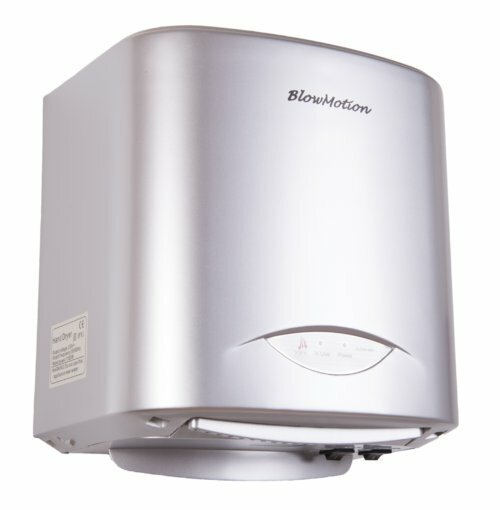 Our high speed hand dryers can dry your hands in as little as 10 seconds! The latest hand drying technology is all about drying hands as effectively and quickly as possible and with jet blade technology, it’s more than possible. Many of our hand dryers dry both sides of the hands simultaneously such as the Ninja Jet Blade Hand Dryer. This machine allows you to place both hands in at once for the quickest hand dry possible. 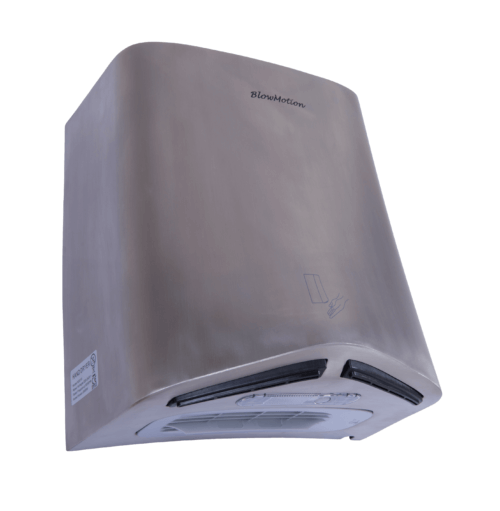 The Jet Blade V is one of our newer hand dryers which has twin blade technology to blast air onto both hands. This hand dryer also has dual sensors which means as soon as hands are detected the Jet Blade V kicks in super speedily so your hand drying time is as quick and convenient as possible. Your customers and clients will certainly be impressed by the high quality and modern functionality of these hand dryers which leaves them more time to shop and use your services. There is nothing more annoying in a washroom than loud, obnoxious hand dryers that are heavy on the ears. If you’re looking to create peaceful and convenient spaces in your building, loud hand dryers are not ideal. Not to mention that excessive volume can be damaging to ears. 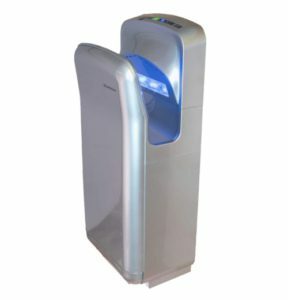 We have a large selection of low noise hand dryers such as the MX2000S, which is one of our quietest products at just 72db and is ideal for people with sensitive ears such as children. When updating your washroom, ensure that the washing facilities you put in place provide comfort and convenience. Start by installing quiet, fast, and contemporary hand dryers! Here a Blow Motion we take into consideration all of these factors and supply a large range of hand dryers that are both contemporary in design and technology. Browse our website to see our range or give us a call on 0800 002 9678 to find out more about a specific product. How Much Should You Spend on Commercial Hand Dryers?